Did you know that most plants actually succumb to overheating more than cold temperatures? Providing cross ventilation lifts and releases hot air build-up inside the greenhouse promoting healthy, sustainable growth for plants. The automated thermostat control saves on electricity by keeping the air flowing only when it’s needed most. We installed the thermostat controlled exhaust fan to the upper back greenhouse wall to work in tandem with the closeable base vents and solar powered louver opener. Total project materials cost averaged four hours to complete with two people and a licensed electrician. Note: These steps are an overview only and should not be used specifically as step-by-step instructions. Each project will have its own unique site challenges. Step 1. Before ordering your exhaust fan, visit the Greenhouse Catalog website to determine which fan size is needed for your greenhouse. 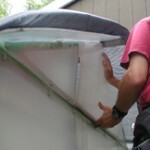 Keep in mind that you need to allow extra room for the entire size of the flange, not just the opening. Step 2. Clear inside of greenhouse to allow for maximum working space. Step 3. Prior to beginning project, charge all cordless tools. Step 4. Pick a clear, cool and dry day to work. Since we had initially installed the Easy-Flow Louver on the back wall, I thought it would be best to place the exhaust fan directly underneath it. Rob contested saying the air would be extracted right out the back and would not promote the ventilation I was seeking. Instead of arguing, I consulted the greenhouse catalog and called the Solexx office. Everyone at The Greenhouse Catalog is so friendly and helpful. 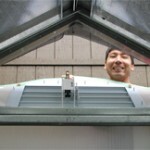 Brian listened attentively and suggested we place the solar powered louver opener in the front of the greenhouse. We overhead water the yard – so it made sense to keep the electrical fan at the back of the greenhouse – protected from water spray. He also advised us that since the greenhouse door is not airtight, that the fan would work best at the back of the greenhouse from a cross ventilation perspective. TIP: When asking husband to assist with installation projects, it is best to consult the experts ‘first’ to make sure both partners are on the same page. This step will save time and aggravation. TIP: Lay the Solexx panel out at least one hour prior to cutting in the sun. It will unfurl flat before measuring, marking and cutting making it easier to use. The aluminum greenhouse frame made it easy to move the louver opener from the back to the front. The front top panels had twin wall polycarbonate which we replaced with 3.5mm Solexx panel material. We used the front polycarbonate panels to create a template for the back to house the exhaust fan. 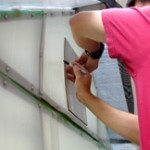 The Solexx panel material is so easy to work with compared to the polycarbonate. The polycarbonate requires a saw with fine toothed blade (high TPI tooth per inch) . The polycarbonate can be scored and cut with a utility knife, but is harder than the Solexx panel and more difficult to cut to size. A black sharpie marker, straight edge and utility knife are all that is required to cut the Solexx panel to size. We had one Solexx panel left over from the initial greenhouse recovering installation this spring which came in handy for this project. 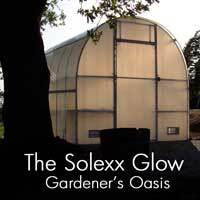 When ordering Solexx panels to cover your greenhouse, I recommend ordering one additional panel to keep on hand. We keep our extra panel material rolled up in the garage. Moving the solar-powered louver opener from the back to the front took ten minutes total. 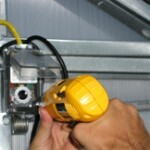 The Solexx ¾” self-drilling screws remove easily with help from a cordless power drill. With the louver opener located in the greenhouse front, I make sure to water the lawn early morning when the louvers are shut so water will not shower the interior of the greenhouse. We replaced the back panel with Solexx paneling. We created a template with scrap cardboard. The template was traced with a black sharpie marker and cut out the hole for the fan with utility knife. TIP: Safety first! Please make sure to hire a licensed electrician to ensure the wiring is to code. Follow the instructions provided in the K-Kontrol temperature control kit. In order to keep the fan quiet, we installed self-stick foam weather stripping on the inside of the aluminum frame. 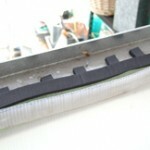 Positioned with the motor facing inside the greenhouse and the louvers face out, the exhaust fan fits snugly. 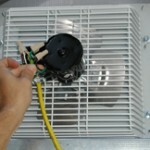 Once the exhaust fan was screwed into place, the thermostat installation began. 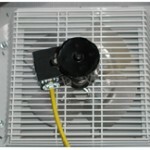 The fan comes supplied with a thermostat, wires, plug and instructions required to install it. The thermostat should be mounted 5’ – 6’ off the ground. It should not be mounted where it can be affected by unusual heat, cold or direct sunlight. Make sure the greenhouse electrical outlet power source is disconnected while working on the thermostat. Strip the insulation 1” down on the yellow wire. The yellow wire is connected into the fan and thermostat. The electrical plug should feed into the same hole as the yellow electrical wire directly into the thermostat. TIP: If the weather is extremely hot, the wire insulation may expand making it difficult to thread both wires together through the hole at the top of the thermostat. 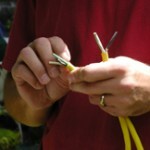 Make sure to work on a cool, dry day when wiring. You will need an 110v outlet to plug the thermostat into. The thermostat should be mounted with the bulb pointed down to protect it from falling objects, dirt, etc. Installation should be checked by a qualified electrician. Once it’s been installed and tested properly, adjust the fan settings. One more item can be checked off the list to having the greenhouse completed before fall. Once the water has been plumbed into the greenhouse we will have a fully functional space to grow and over-winter tropicals successfully for years to come. 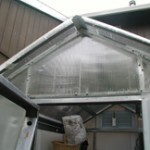 Have you added an exhaust fan, base vents or louver opener to increase the ventilation into your greenhouse? Let us know how they are working for you. Photos taken by Dawn Hummel. This entry was posted in Greenhouses. Bookmark the permalink.